You are a sinner. I’m sorry to break it to you. I know it’s not politically correct. But it’s true. Many of your thoughts, actions, and deeds do not bring glory to God. Neither do many of mine. Truth demands that we call things the way they are. You and I are sinners. We can live in denial of this fact. We can pretend like everything is ok. We can create a politically correct world in which we never tell the truth. But it won’t change the truth—we are sinners. 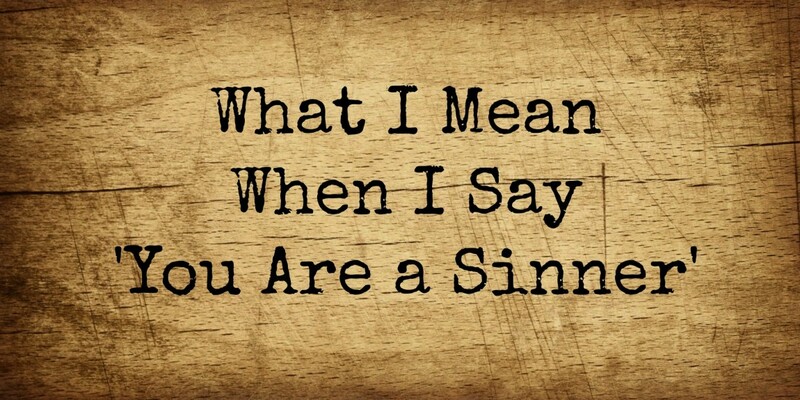 Whenever I say “You are a sinner,” what that means is you are just as bad as me. It doesn’t mean you are worse than me. It doesn’t mean you are different from me. It actually means you are just like me. You are a sinner in desperate need of God’s love and forgiveness. Yet we cannot experience his forgiveness unless we understand why we need it. And we cannot understand the power of his love unless we have experienced his forgiveness. When I say “You are a sinner,” I am saying you are the very person which God loves, has sent His son to save, and you have every potential of experiencing heaven if you recognize your sin and turn to God for forgiveness. You are worse than me. While some may use this phrase with these meanings, it is not my meaning and it clearly is not the meaning of the Bible. One rejects the statement. They can’t believe one person would have the audacity to call them out for their actions. They claim the other is bigoted, old-fashioned, brain-washed, and mean. The other accepts the statement. They know of their imperfections. They recognize their weaknesses. They confess their need for God. Our lives are greatly determined by which we response we chose. God’s love is available to all, but many will never receive it because they will not recognize their need for it. Whenever I say “You are a sinner,” you have every right to doubt me, debate me, or just plain ignore me. But you do not have a right to ignore what I mean and make me out to be saying something I’m not. I don’t think I’m better than anyone. I’m not claiming any moral high ground. The worst I can possibly say about you is that you are as bad as me. Your thoughts spell out why Phil’s response to his suspension are so much better than his comments in the GQ article.